I have a Black & Decker Press & Dress iron. I am not the best at ironing but this iron works extremely well and takes out all of the wrinkles in all of my clothing without any effort at all. I also like that the iron has many features that make it easy to use and it has a lot of variable settings for any situation it would encounter. Some of the things I like about the iron are that it heats up extremely fast with its metal heating surface. This is important because I am able to iron my shirt and pants in the morning before work and it saves me a lot of time when I get ready in the morning. The indicator light on the base of the iron lets me know exactly when the iron has completed heating up to the appropriate temperate that I have selected. It has an an adjustable dial with six temperature settings that make it suitable for any article of clothing or clothing material I have in my wardrobe. From silk to cotton this iron will handle anything I can throw at it. It also has an easy to fill large reservoir that can be filled with water and makes it ideal for steaming clothes. It features an adjustable steam setting as well which controls the amount of water released. 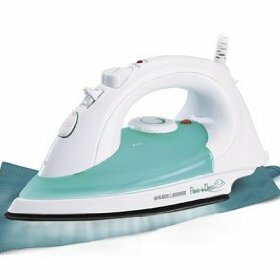 This feature is great for ironing delicate items which may melt or burn if an iron was applied to them. The iron has a long extension cord making it easy to maneuver and gives you plenty of room when ironing all of your clothing. Finally, the iron is extremely durable as it is made by Black & Decker and I have never had a problem with it since I bought it.